What do Sundays mean to you? In our home, Sundays are a day of rest, worship, and connecting with family and friends. It’s a time to slow down and reset for the week ahead, appreciating what’s in front of us. We treasure these days. Ode to Sunday is a small independent brand from Lithuania that focuses on manufacturing minimal and effortless pieces, with ethical and sustainable practices. I really admire Ode to Sunday’s appreciation for local resources and their focus on creating timeless, high-quality garments. They have a passion for cultivating connection and community and have a dedicated “stories” section on their website highlighting the lives of various inspiring women. Ode to Sunday so kindly gifted me two pieces from their collection to try out and review. As I was preparing for my Spring capsule, I had been looking for more linen pieces to add to my wardrobe, so I was very excited to add these two garments to my wardrobe. I’m all about comfort, versatility, and function when it comes to what I wear. These two pieces definitely fit into those categories and I can see myself wearing them all throughout Spring and Summer. I’ve been teasing a bit with the linen pants on my Instagram so I’m excited to finally share them with you! In this first look, I’ve styled both of the Ode to Sunday pieces. I’m wearing the Zoe Wrap Dress in bluish gray and the Camilla Pants in black. Unfortunately it’s still snowing here in Toronto as I’m writing this post, so I’ll have to wait a few more weeks until it’s warm enough to wear this outfit. I’ve paired this outfit with some Sandgrens clogs, completing this casual, laid-back outfit. I can see myself wearing this outfit to a summer farmer’s market or a brunch date with friends. This next look is my kind of go-to outfit. I’ve tucked in an oversized silk shirt into the Camilla pants and finished the outfit off with my favourite pair of sneakers. I did say I would share more about these pants, so here are some details. I wearing the Camilla Pants in a size XS. I have to admit that these are probably my favourite pants right now. The fit of these is just phenomenal. They are a high-waisted, wide leg, cropped pant and have just the perfect amount of “wide” in them. There are also belt loops with an optional detachable linen tie at the waist. The details of this pant were so well thought out and are clearly evident in the beautiful pleating of the pant, the tailored fit, and the fine details of the button. I was asked about the “wrinkle factor” of these pants, and surprisingly as I’ve worn them, they have not been too wrinkly. 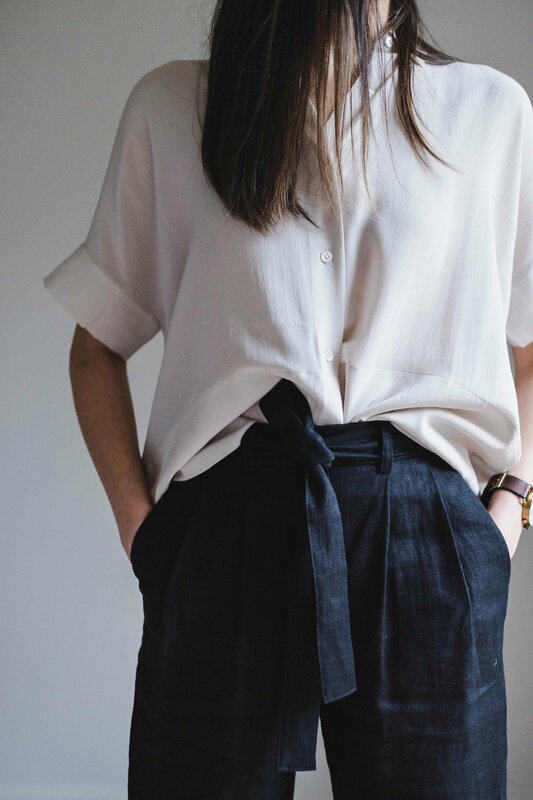 I personally love the look of linen and the wrinkles that form throughout the day because it’s almost like telling a story through your clothes. This third look is a more relaxed feminine outfit. I love the ease and simplicity of the wrap function of this dress. It’s such a simple, yet intentionally designed piece. It has a modest relaxed straight fit that falls just below the knees. I’ve paired this dress with some matching grey sling back heels. I’m wearing this Zoe Wrap Dress in a size XS and in the colour bluish gray. This dress would be perfect for a relaxing weekend afternoon coffee date or drinks on the patio (when it gets warm enough). I can also see this dress being transitioning beautifully from casual to semi-formal with a quick change in shoes and hair and accessories. Why linen? I personally love linen because of it’s comfort and breathability. Linen is a natural, sustainable material that comes from the flax plant. It actually uses less water to produce than cotton, which is another very popular “warm weather” material. A con for linen is the wrinkling that occurs, however, it may be viewed differently depending on your wrinkle tolerance and can also be avoided by the specific linen pieces chosen. It is also generally a more expensive natural material because of the time and effort it takes the produce. These Ode to Sunday pieces are intentional additions to my wardrobe and have helped fill a gap in my capsule. These are pieces that I know were made to last through different seasons of life. Through my correspondence with Agne, one of the co-owners of Ode to Sunday, I could sense the deep personal connection and care that she not only has for her collection, but also the people for whom the garments are created. You can explore and shop the full Ode to Sunday collection here, and maybe add some delicate linen pieces to your wardrobe this season. Ode to Sunday is generously offering a 15% discount to my readers, with the code candicemtay15. This discount applies to all products except for the “donation” section and will expire on April 18th. 11:59 PM, EST. This post is in partnership with Ode to Sunday and contains some affiliate links. When you choose to shop items on my blog through my links, you help support my Instagram and blog. I only share products and brands I love and support. All opinions are my own. Thank you for supporting Candice Tay!